President Barack Obama speaks to the media after receiving an update from military leaders on the campaign against the Islamic State, during a rare visit to the Pentagon, July 6, 2015. U.S. President Barack Obama says the fight against Islamic State radicals will be long, hard-fought and require more than American military might to win. “There will be periods of progress, but there will also be some setbacks,” added Obama, who has pledged to neutralize and defeat Islamic State militants without dragging America into another ground war. The president, who once conceded the U.S. lacks a “complete strategy” to battle IS, met with Defense Secretary Ash Carter and top military commanders and intelligence officials. The gathering followed a weekend of intensified airstrikes by a U.S.-led coalition against the militants, who have taken control of large swaths of northern and western Iraq and eastern Syria. The coalition conducted 38 strikes, with nearly half directed around the self-proclaimed IS capital of Raqqa. Obama spoke of a continued multi-pronged campaign in which coalition forces attack IS from the skies while taking steps to root out the group’s financing and strengthening local forces for ground operations in Iraq and elsewhere. He noted the militant group’s success in reaching out to potential recruits in faraway lands, including the United States, and said defeating IS will require more than military might. One of the president's fiercest critics in Congress, Sen. John McCain, called the administration's campaign against IS one of "self-delusion." McCain said "there is no compelling reason to believe that anything we are currently doing will be sufficient to degrade and ultimately defeat ISIL." 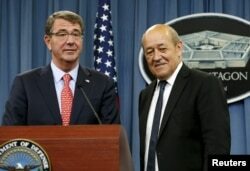 U.S. Defense Secretary Ash Carter (L) and French Defense Minister Jean-Yves Le Drian prepare to leave after a joint news conference at the Pentagon, July 6, 2015. Earlier, Carter met with French Defense Minister Jean-Yves Le Drian, who called Islamic State a "terrorist army" rather than a "terrorist group." Le Drian vowed French forces would continue to work with the coalition to "block" Islamic State from taking over Iraq. France does not participate in airstrikes in Syria but has used its Charles de Gaulle aircraft carrier to launch airstrikes into Iraq for months. Coalition strikes began in Iraq last August and in Syria a month later. Warplanes have conducted more than 5,000 combined airstrikes, according to White House data, in missions that officials say have helped Iraqi troops and fighters in Syria reclaim some territory from the militants. "We believe that we have an impact on [Islamic State]," Pentagon spokesman Col. Steve Warren recently told reporters in Washington. Despite the loss of a quarter of the land the group seized in Syria and Iraq, however, “they remain a potent force," he added. But progress has been limited, with the Iraqi military still unable to achieve widespread success on the ground in reclaiming major northern and western cities. It has been aided by Iranian-backed militias and Kurdish fighters in operations such as the ongoing effort to take back Anbar province. FILE - Iraqi security forces defend their headquarters against attacks by Islamic State extremists in the eastern part of Ramadi in Anbar province, May 14, 2015. So far, Obama has resisted calls to send U.S. ground troops back to Iraq, instead deploying advisers and trainers to try to boost the Iraqi troops. The United States also has struggled to find moderate Syrian rebels to train. The Associated Press reports fewer than 100 rebels have been trained to date, a fraction of the 5,400 intended fighters. Carter has said the small number is due to a difficult vetting process partnered with the requirement that those trained must be willing, at least initially, to solely fight Islamic State forces rather than the forces of Syrian President Bashar al-Assad. U.S. General Martin Dempsey, chairman of the Joint Chiefs of Staff, has said the U.S. won’t take any shortcuts on vetting because of the risk that would pose not only to coalition forces, but also to the objectives the coalition is trying to achieve.